Filipino prisoners of war of the Japanese on burial detail in Camp O'Donnell. Camp O'Donnell was built in 1940 to train Filipino youth, then became the base for the 71st Philippine Army Division. The 71st lacked water at the unfinished camp, so they drew from a stream nearby. In April 1942, O'Donnell was selected to receive the expected 28,000-40,000 Filipino and American prisoners expected with the surrender of the Bataan garrison. Instead, some 78,000 began the 66-mile (106-kilometer) trek from Mariveles on the south coast of Bataan to San Fernando, where the survivors were loaded onto boxcars for the journey to Camp O'Donnell in Tarlac. Many died in the cramped conditions; prisoners were unable to sit down the entire journey and received little food or water. Once they arrived, they queued for hours around the single water tap. The stream was contaminated with feces from the huge numbers of prisoners. Many were so exhausted and starved they lay in their own feces around the camp hospital. In a report in November 1945, Colonel James W. Duckworth (September 6, 1890-December 26, 1945) the American doctor in charge of hospitals on Bataan and appointed by the Japanese to be O'Donnell's senior physician in May 1942, wrote "conditions were so bad that, between the period of April 15, 1942 and July 10, 1942, there were 21,684 Filipino deaths, a mean average of 249+ per day, and 1,488 American deaths, a mean average of 17+ per day. On May 22, 1942, an all-time high for the period was reached when there were 471 Filipino deaths and 77 American deaths. The strength of this camp on July 6, 1942 was 240 Americans and about 35,000 Filipinos." This image was probably taken sometime around January 1943 because the men are wearing long pants and sleeves; their clothing would have been too hot in summer. They wear cloth over their mouth and nose because of the stench of the corpses. 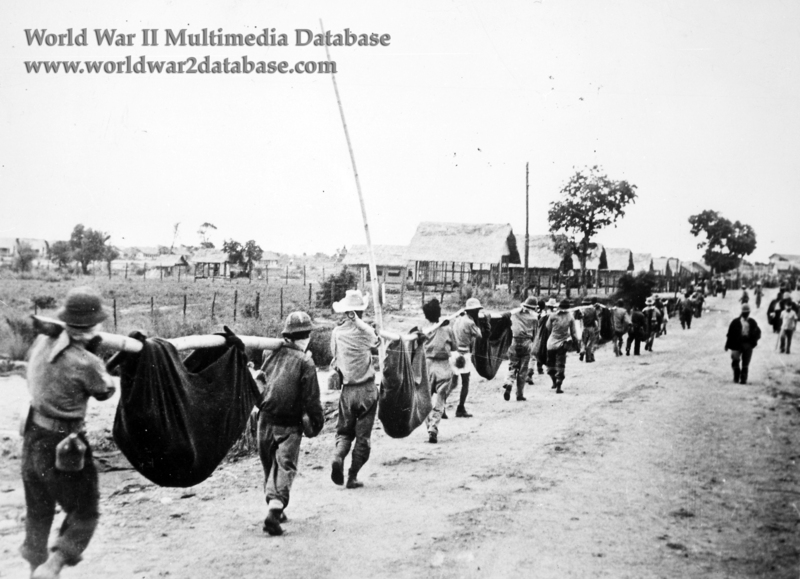 This photo was found by advancing American soldiers and released as photographic evidence of the Bataan Death March in March 1945. In March 2010, the caption was corrected to depict an O'Donnell burial detail. Veterans claimed it was unlikely that the Japanese guards would have allowed prisoners to carry others as the original caption suggested. Japanese rightists seized on the caption being changed to debunk the reality of the Death March.